Norwich City's board have accepted mistakes have been made this season - and confirmed they will name a new manager "within a week". 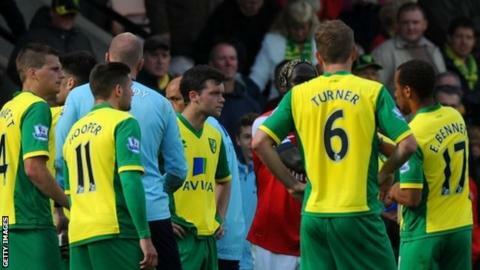 The Canaries' relegation was confirmed on Sunday as they slipped to a 2-0 defeat by Arsenal at Carrow Road. The club have a shortlist of "three or four" potential managers, with current boss Neil Adams among them. "We got it wrong, we made mistakes," chief executive David McNally told BBC Radio Norfolk. "Relegation this year was entirely avoidable. "We are gutted, disappointed, deeply frustrated and quite embarrassed that this great club has suffered relegation. The board recognises we have made mistakes." Adams was put in charge for the final five games of the season following the dismissal of predecessor Chris Hughton in April. The 48-year-old collected only one point from those five games and the Canaries' three-year stay in the top flight was ended by Sunday's reverse, their 21st of a miserable campaign. The Carrow Road board, which includes celebrity chef Delia Smith, her husband and joint majority shareholder Michael Wynn Jones, as well as McNally, waited until last month to sack Hughton following a run of four defeats in six games. But it has been a season of struggle for the Premier League's lowest scorers, for whom £8.5m record signing Ricky van Wolfswinkel scored just once, in the opening day draw with Everton. McNally said he would not be considering his own position at the club. "If I felt it was in the club's best interests for me to leave I wouldn't hesitate. I don't think it's in the best interests," he said. "The board is united and absolutely up for the fight of getting the club back to the Premier League as soon as we can." Former Norwich defender Malky Mackay, 42, who settled his dispute with Cardiff this week following his sacking by the Bluebirds in December, is a strong favourite to be Norwich's manager in the Championship next season. Gianfranco Zola, who, like Mackay is an ex-Watford boss, has also been linked to the job, while Adams remains in contention. "We have a shortlist. People that we've spoken to. People we are speaking to," said McNally. What could have saved Norwich on the final day? "Neil is a credible, serious contender. He's done a very good job in very difficult circumstances. Talk about giving him a poisoned chalice. "What we've seen is there is a manager of the future there. But we are talking to other people. There are three or four names." Discussing his future after Sunday's defeat, former Canaries midfielder Adams said: "I've been told that there's a process that they will be going through now. I await the decision with everyone else. "I've made it clear I would love to be the manager of the club. That's up to the board, but I've had no indication one way or another and we have to wait until next week."